Kevin Emslie’s blog explained the 5 reasons why we monitor endangered and priority species in South Africa. I would like to explain the different types of tracking collars that we use in monitoring and why they are so important in obtaining the vital information we need to research selected species. We will look at the different types of tracking collars / transmitters used, the cost of each, as well as the advantages and disadvantages of each option. It allows researchers and managers to collect baseline data like home range sizes, daily movements, behavioural data and diet. 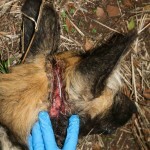 Radio tracking involves fitting the study animal with a radio collar. These collars are designed to minimize impact on the animals’ behaviour and to maximize their detectability. They come in a variety of belt and battery sizes; in general the weight of the collar should be no more than 4 to 5 percent of the animal’s body weight for mammals, depending on the species. 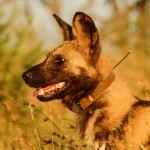 For example, the weight of a collar for an wild dog shouldn’t exceed 450grams. Depending on the species of animal, the collars can be customized with sensors to recognize different movement activity, temperature and even mortality. When the movement sensor detects no movement, after a pre-programmed period of time, it changes the pulse rate to a higher or lower rate indicating change in behaviour (e.g. resting or stationary). How they work: The ‘VHF’ stands for ‘very high frequency’ collar, also known as a pulse collar. 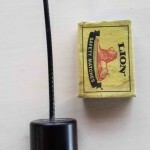 VHF transmitters attached to a study animal emit a pulsed radio signal allowing a person to physically locate and observe the animal by homing into the signal using a receiver and directional antenna. Advantages: VHF transmitters are easy to use, reliable, versatile and affordable providing exceptional value. They can be used for a wide variety of animals, and the operating life of the battery can last up to three years. This type of collar can be available with an internal antenna as an option, for use when there is a high chance of the antenna being chewed. 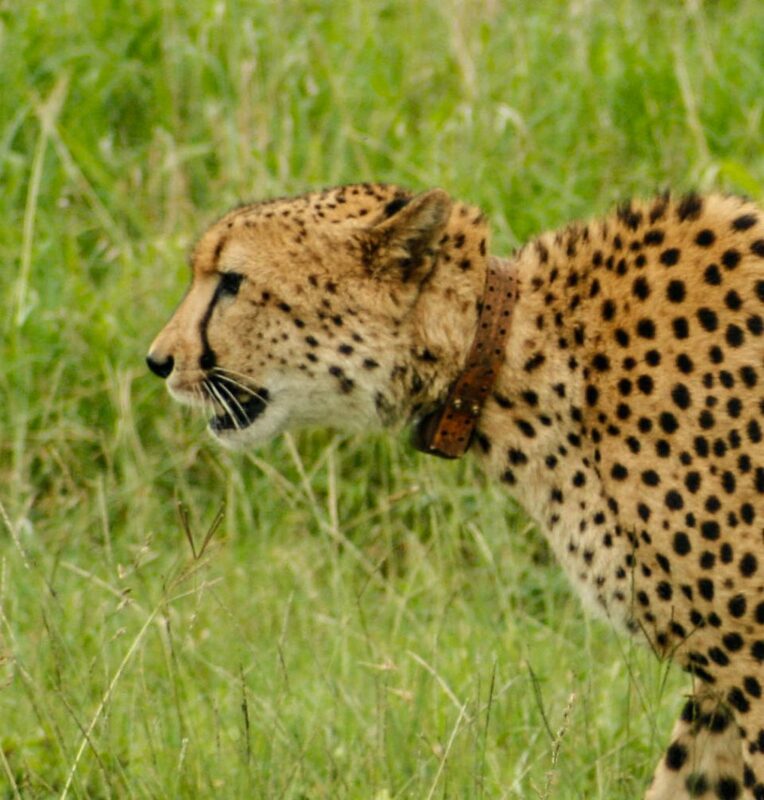 The animals on which these tracking collars are fitted: Collars are fitted around the necks of wild dogs, cheetah and lion. Collars are also fitted onto the ankles of black & white rhino. 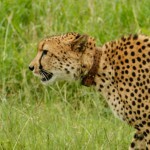 Cheetah wearing a VHF collar with internal antenna. 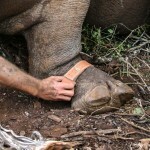 VHF collar with internal antenna being placed on a rhino’s ankle. 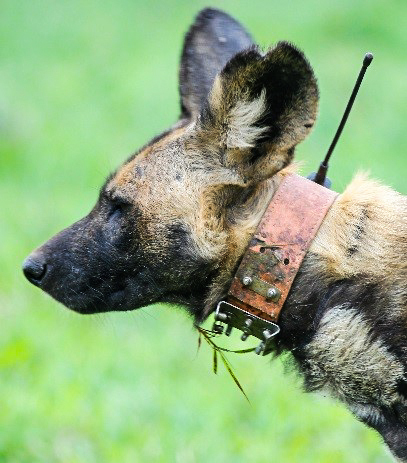 Wild dog wearing a VHF collar with an external antenna. 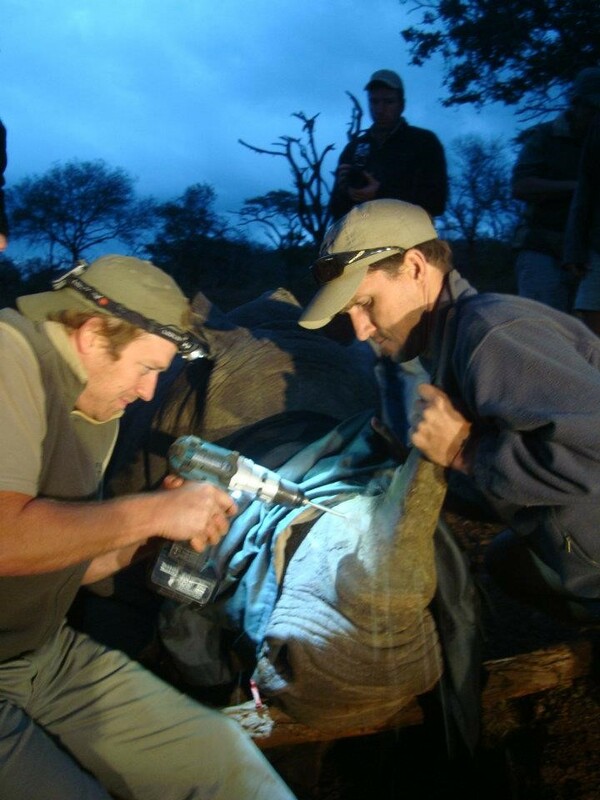 For black and white rhino a VHF transmitter can also be drilled and inserted into the horn of the rhino. Due to the small size of the transmitters however they only last 18 months to 2 years. 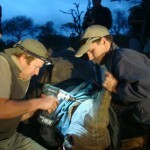 Professionals drilling into the rhino’s horn to place an internal VHF transmitter. 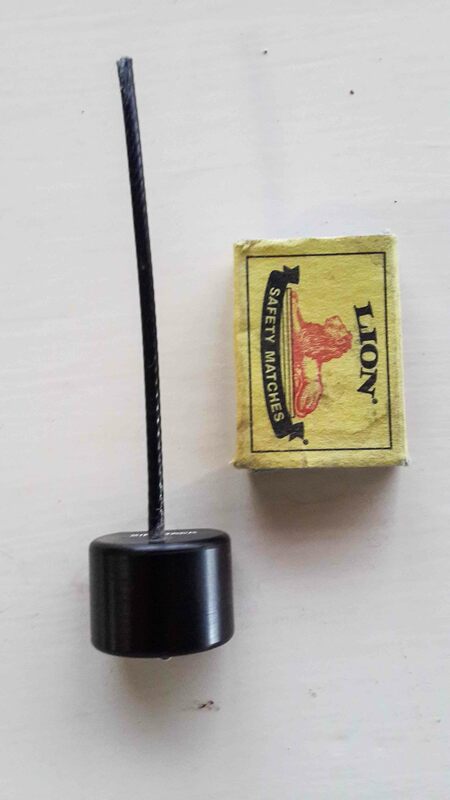 The size of the internal VHF transmitter implanted into a rhino’s horn compared to a matchbox. 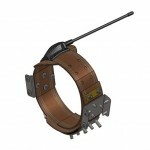 How they work: Exactly the same as the standard VHF collar, with the small addition of a studded metal plate. They function like a standard VHF, with the added advantage of the studded plate increasing the chance of the snare getting caught around the collar of the animal and not the neck, preventing suffocation. Advantages: All evidence from our intensive monitoring using these collars has shown that in addition to gathering important data, the collars also save lives. The snare wire gets caught on the studded collar, thereby eliminating the noose effect around the neck. 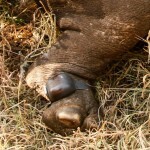 This allows time for the monitors to track the animal and get a vet in to remove the snare, saving the animal’s life. 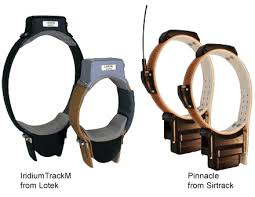 The animals on which these collars are fitted: Animals which are monitored in high snaring areas. Diagram of an anti-snare VHF collar with an external antenna. 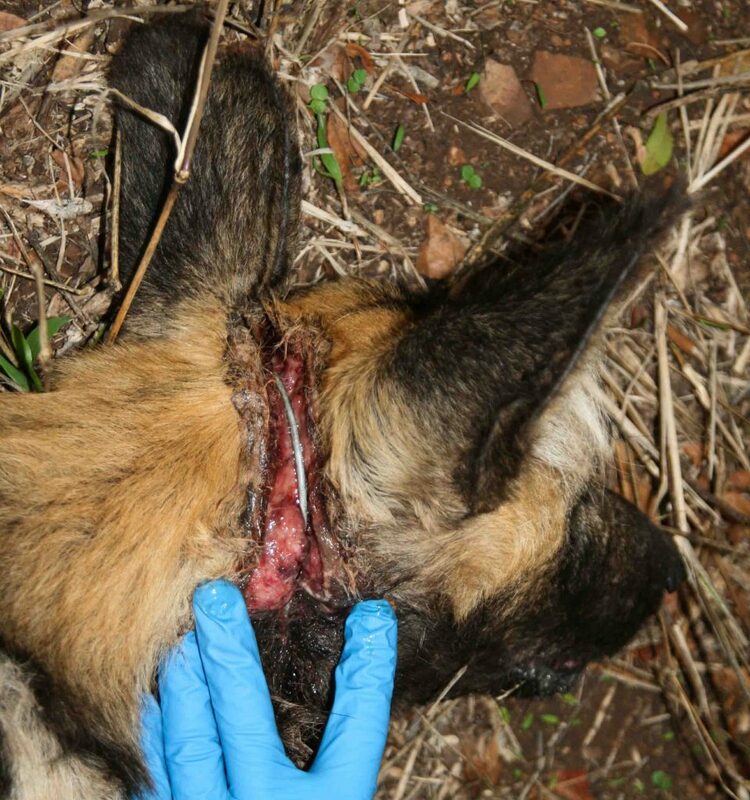 An wild dog caught in a snare, not wearing an anti-snare collar. 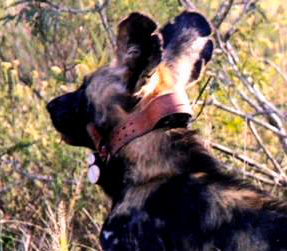 Endangered wild dog wearing an anti-snare VHF collar. How they work: GPS tracking collars allow for remote detection of the collared animal’s position.The Global Positioning System is used to record the animal’s exact location and store the readings at pre-set intervals. Locations are logged and can then be downloaded in various ways. The older GPS collars used to store the data until the collar was retrieved. Now, most GPS collars allow the data to be downloaded remotely. GPS/GSM collars use GSM cell phone signal to download data. Store-on-board GPS collars can store data which is then downloaded remotely using a handheld UHF device. SAT/GPS collars use global Satellites to transmit the position and other data to a user’s server/desktop. Advantages: The main advantage GPs collars have over VHF collars is that data can be collected at any time of the day or night remotely and regularly. 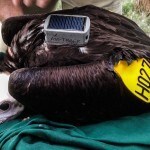 Most GPS collars are also fitted with VHF capabilities so animals can still be tracked conventionally, allowing for observational research to be conducted. Disadvantages: A huge negative is that these units need more power to function than the standard VHF units, which obviously adds to the total weight of the collar. So the smallest possible batteries need to be used which usually results in reduced battery life, especially on the smaller species, and these smaller collars operate for less than 12 months. GPS/GSM units use mobile phone signal which is limited in some areas so cannot be used, or provide poor performance. Another disadvantage of these tracking collars are the costs, see prices below. The animals on which these tracking collars are fitted: GPS collars are fitted around the necks of wild dogs and cheetah, and in the form of a harness or “back pack” on vultures. 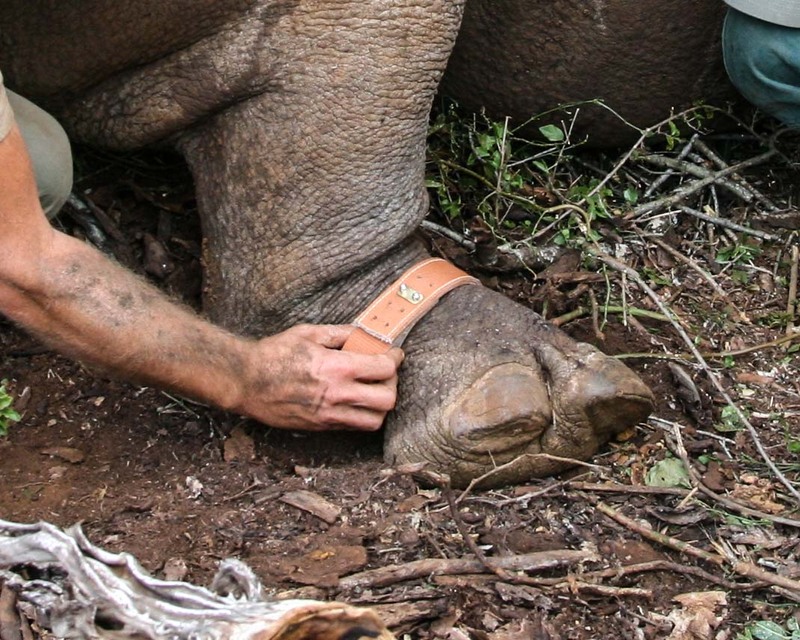 GPS collars are also used effectively on the ankles of black & white rhino. 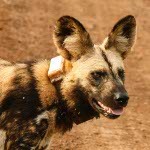 Endangered wild dog wearing a GPS/GSM collar. 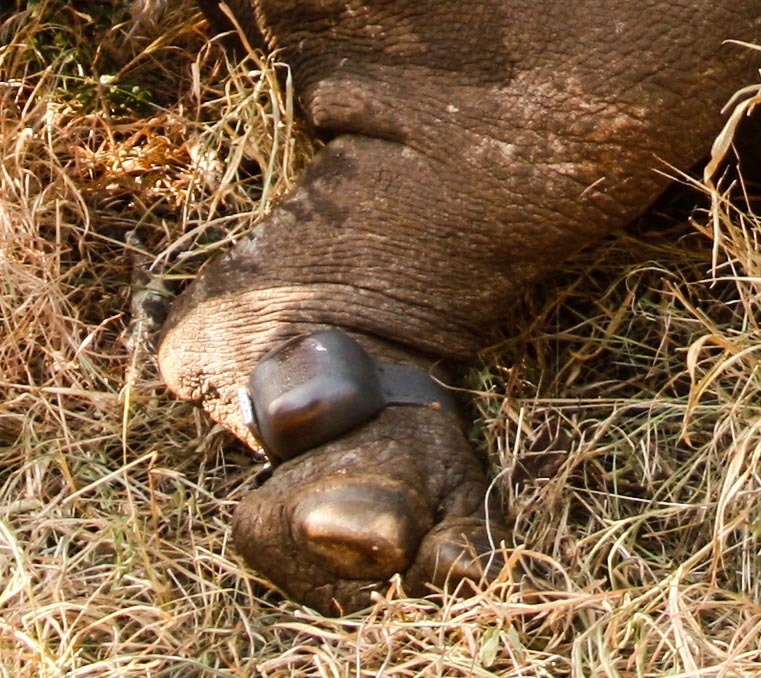 A rhino wearing a GPS Store On Board ankle collar. 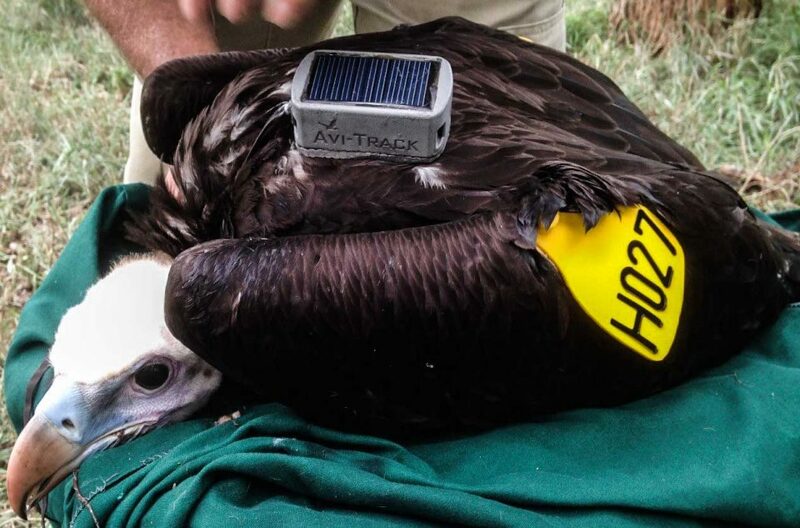 A vulture wearing a GPS/GSM backpack. 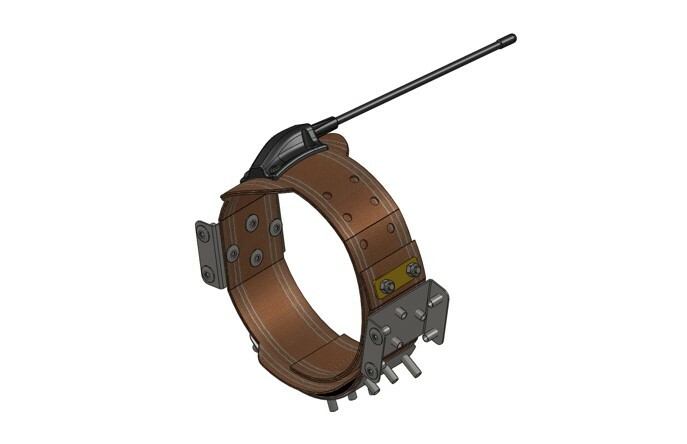 Diagram of various satellite collars available. 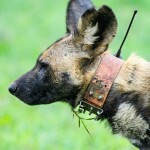 Wild dog wearing a satellite collar. Method of Locating the Collar Monitor searches for the radio signal from the collar, then records,a,location on a handheld GPS. More time consuming in field work. Collar send GPS locations via GSM mobile phone coverage, or,remotely,downloaded with a handheld UHF device. Visual mapping data,available via,Google Earth. Collar sends its location data to monitor by e-mail. Visual mapping data available via Google Earth. Less field time required. Data Acquired As a visual sighting, data is collected on home range, habitat usage, animal behaviour, population demographics and diet. Position of animal is recorded to determine home range and habitat,use,,however no behavioural data is recorded, unless it has a VHF,attachment. Position of animal is recorded to determine home range and habitat,use.,Ideal to use in inaccessible areas. However no behavioural data,is,recorded. Mortality Sensor Monitor discovers a faster radio pulse if animal has not moved for more than 4 hours. If fitted with a VHF attachment a faster radio pulse will be,transmitted,if animal has not moved for more than 4 hours. Alternatively,GPS,position is a static point. Collar sends an email (mortality alert) that the collar is stationary.